A few weeks ago, we opened our doors up to show you our first completed (almost!) room. 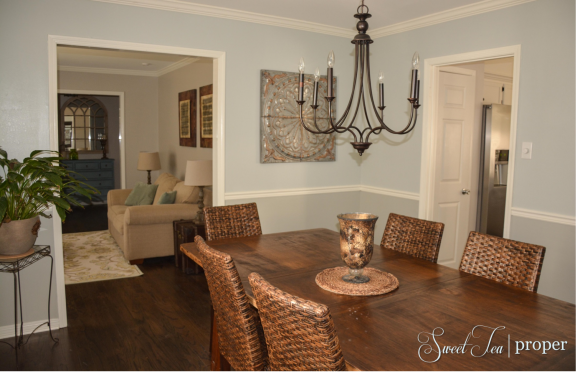 If you missed it, you can check out our formal living room aka “the music room” here. Today we will continue our tour into our mostly complete dining room. With Cecilia gaining more head control by the day, we hope that within a couple of months she will be able to sit in her high chair. After that (hopefully) our hardly used dining room will become a place of gathering and connection once again. Although Cecilia is only a little baby at this point, it is so important to us to establish the routine of eating together as a family. No TV. No cell phones. No tablets. Just us, conversation, and some good food! Our dining room underwent one of the more noticeable transformations in the house because it was the only room with wallpaper. If you are looking for an easy way to remove wallpaper, you can find our tutorial here. With only one room needing this, I found it kind of enjoyable. It’s one of those projects where you get to see the results relatively fast and that always feels good. The room also had brown wood chair rail molding, a brass chandelier, and brown wood blinds which added to its dated appearance. Below is a list of all of the projects that took place to transform our new dining room. Painting can be a tricky thing. Sometimes the hardest part is just finding the right color and then hoping it looks like you want it to when it dries. The dining room was one room where the paint was an initial headache. Since the room had a chair rail, I thought it would be aesthetically pleasing to have the top portion of the walls a light gray and the bottom portion of the walls a dark gray. Well, I painted the bottom first (although in hind sight this makes zero sense to me) and the color was exactly what I wanted. I moved on to the top part and almost immediately thought, hmm this isn’t quite what I expected. Not wanting to buy a whole new gallon of paint, I decided to finish and see what it looked like once it dried. What a disappointment. My lovely medium gray paint (which had “gray” as part of its name, might I add) looked blue. I had Mr. P take a look at it and he confirmed, it was blue. Ugh! This was not what the look I was trying to achieve. I decided to go ahead and paint the trim, molding, and chair rail. These were still the brown wood at this point. After a couple of coats of Dover White, I took a step back and something happened. My blue and gray walls looked amazing! In fact, I even liked it better than if it were light gray and dark gray. 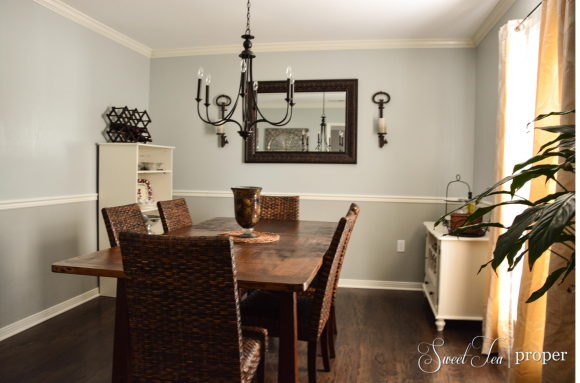 The contrast of blue and gray with the soft white trim completely transformed the room. We have received so many complements on our color selection. Yep, the one I never would have picked intentionally. Our dining room isn’t very large so the furniture was kept to a minimum. Besides a small plant stand, there are only two small cabinets used to store wine glasses and serving dishes. 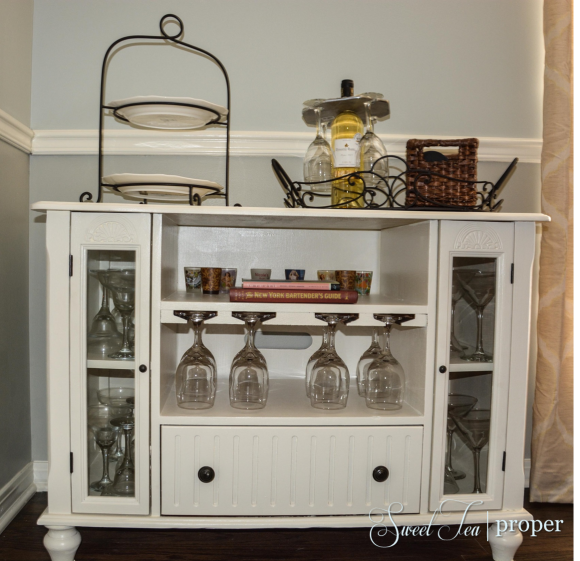 This mini wine cabinet was one of by first DIY projects. Since it was completed well before Sweet Tea Proper was founded, I don’t have a tutorial, but its first purpose was quite different. Do you recognize what this was before the transformation? A TV stand. One of my dear friends picked it up off of the street and gave it to me when I moved into my first house. I cleaned it up, has a neighbor put in the wine glass holders, sanded it down, and restained it. Recently, the stain started to wear on me and I decided to paint the whole thing white. You just can’t beat a free piece of furniture. Thanks for dropping by. We have plenty of rooms left to reveal and projects to share. One of my all time favorite projects is coming up next! Have a great week!